Apple loaned our department a 20” iMac with Intel Core Duo processor for a one-week evaluation. They call this “seeding the market.” Because I’m already familiar with iMacs and their brilliant 17- and 20-inch displays, I seized this opportunity to explore their newest feature: the ability to run Windows natively on the Mac’s Intel CPU. I also had done this briefly on a MacBook Pro, but alas that laptop was a short-term loaner as well. I am thoroughly impressed with the results. Both the MacBook Pro and the iMac deliver Mac OS X and Windows XP at full speed with 100% functionality of all components (except the iSight camera, at least at this point). Here are some notes made while installing Boot Camp Beta and Windows XP on a 20-inch (256 MB VRAM) MacIntel iMac with 2 GB RAM and a 250 GB SATA drive. 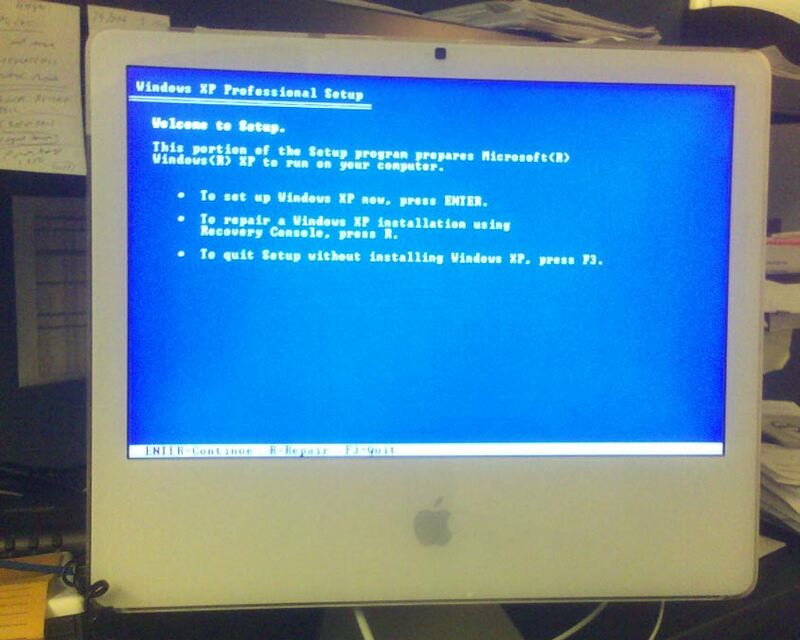 Intel iMac booted into the Windows XP installation screen. The Intel 2.0 GHz dual processor CPU is very fast in both Mac OS X and Windows XP. Photoshop CS2 and Microsoft Office components run swiftly in both operating systems. Office 2004 Pro for Mac is not a Universal Binary for Mac OS X and thus is using the Rosetta interpreter, but the performance degradation was unnoticeable. Creation of the "Macintosh Drivers in Windows" CD-ROM in Boot Camp-setup consolidates optimized Windows drivers for: video, audio, networking, Wi-Fi, Bluetooth, DVD-RW, etc., for easy installation in the Windows XP operating system, after its first reboot. The iMac’s ATI Mobility Radeon X1600 display card with 256 MB VRAM can run at 1680 x 1050 in Windows on the 20-inch screen. Second monitor support with extended desktop capability appears to be ready in the Display Control Panel, but not tested yet because a DVI adapter must be ordered from Apple first. While in Windows I viewed Device Manager. It is remarkable to see Windows interpret what I am used to viewing as Macintosh hardware. 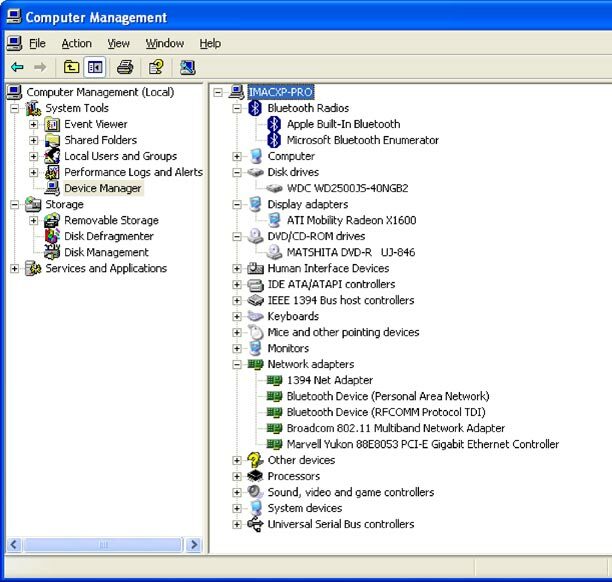 Windows XP Device Manager control panel interpreting the Intel iMac's innards. The volume up/down and mute buttons work. Without the user staying present to make a selection at bootup, the iMac will repeatedly restart or boot into Windows XP or Mac OS X, your choice, based on whatever you were last using. It's only when you want to switch from Mac OS X to Windows or vice versa that you need to hang around momentarily to depress the Option key right after touching the power button or restarting, which eventually brings up the OS choice screen. Of course it's rumored that soon-to-be-released Mac OS X 10.5 Leopard will enable Windows to run concurrently within OSX and not require any restarting as with Boot Camp's dual boot setup. The entire Windows XP partition and contents can be seen in Mac OS X as a secondary volume, and files can be copied to and from. This means that any work that was created while in Windows may easily be “imported” into Mac OS X where I prefer to work. Thankfully Mac OS X can read the Windows NTFS file system. Norton Ghost V.2003 installs but will not boot the iMac, neither as a virtual partition nor as a CD-boot disk. Norton Ghost 9 (a newer product) was chosen instead, and required Microsoft .NET Framework 1.1 and its Service Pack 1 and 1.1 updates. Although Ghost 9 successfully boots the iMac, it cannot be used after that because the Norton 9 CD has no USB drivers for keyboard and mouse. However Norton 9 as a program manages to perform a full drive clone of the Windows XP partition while Windows itself is active, a process I still cannot fully grasp due to my assumption that an NT-based OS will not relinquish control of the hardware. But it does work, and this means that my preference for doing full clone backups of an optimized Windows system is met. Of course Apple's included Disk Utility delivers perfect Mac OS X clones, and because Mac OS X sees the Windows XP NTFS partition, it can be cloned via Disk Utility as well. My daughter is about to go to college, residing in a tiny dorm room. She is an intensive user of both Mac and Windows, and now she can have one machine serve both purposes. I am convinced that buying a non-Mac personal computer in the future will be unnecessary, if not unwise, because Apple's Mac-Intels handle Windows with full performance and grace, plus you'll have all the benefits of Mac OS X.